*Iray is a physically based rendering engine that handles global illumination and shadows differently from iClone and Character Creator. So straight-forward auto-conversion of scene materials, lights, and environments is not realistic. 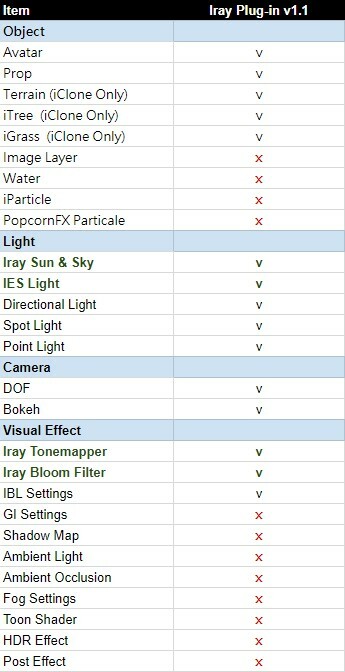 *The Iray render plugin provides tonemapper and bloom filter functions for adding additional post-effects to the final render, see Manual for more details. Why are the renders between the Iray plugin and iClone / Character Creator viewport different? Does the Iray render plugin support iClone/Character Creator visual settings and effects? What are some of the limitations of the Iray render plugin? Can I use external custom MDLs with the Iray render plugin? Article has been viewed 144 times.